AA Tree is a form of a balanced tree used for storing and retrieving ordered data efficiently. It supports the following operation: addition, deletion, searching and enumerating entries in a defined order. An ordering operator for entries is required. 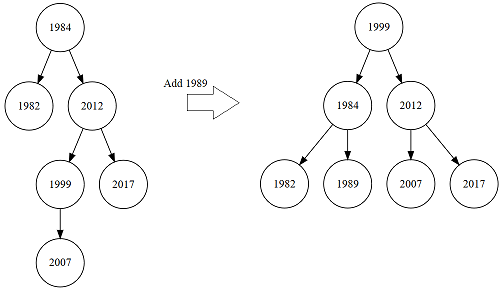 AA Tree was invented by Arne Andersson in order to simplify the implementation of operations in comparison to a more traditional Red-Black and AVL trees found in many libraries. See links below. AA Tree can be used to implement useful collections: Set, Dictionary, Immutable List, etc. This picture illustrates the effect of an addition of the item to the AA Tree that causes tree rebalance. AATree<TEntry> requires a comparer implementation to perform key comparisons. You can specify an implementation of the IComparer<T> generic interface by using a constructor that accepts a comparer parameter; if you do not specify an implementation, the default genericcomparer Comparer<T>.Default is used. If type TEntry implements the System.IComparable<T> generic interface, the default comparer uses that implementation. The foreach statement of the C# language returns entries ordered by key. Sequential prefix function - an immutable version of AA Tree can be used for this problem.